When I first thought of this project last year, I was kinda hesitant to pursue it mainly because it would be expensive and it is going to be an exhausting journey. Then, I thought about collaborating with hotel and resort owners as well as regional, provincial, city and municipal tourism offices and see if they can help me out one way or another. I started contacting them and luckily, a number of them have responded positively about the project. When I started receiving emails from companies and tourism officers, I felt really happy and excited. It’s a confirmation that my advocacy to promote local tourism to the rest of the Filipinos and the world is doable. I spent weeks just to lay out the itinerary. There are a lot of considerations to be made like bus and ferry schedules, travel time and etc. Last night, I have finally came up of a schedule where I am heading to in this epic 50-day journey. Please contact me should you be interested to meet up with me in any of the destinations listed below. If you are a company and would like to help me out in this advocacy, please contact me by email at info(@)escapemanila.com. Why is Cebu not part of the list? If you'll happen to change your itinerary I might tour you around. Good luck on this one sir!! looking forward for your next adventures. Good Luck on 50 days of backpacking. I'm sure you'd really enjoy the experience. I really wanted to go there but it's kinda out of way. It's going be really more expensive if I drop by Cebu or Bohol. Hmmm, that's why I am going to do it in summer. Chances of strong rains/typhoon is rare. Goodluck to you and hope to hear more about your activities when you get there. You're such an envy for having the luxury to travel. Keep safe. Wow, I really envy you on this project, I would love to come with you but right now I'm having problems with the budget. Good luck and God bless on your journey. Yay this is it! Goodluck and have fun! Cool. Dreaming of making a project like this. You're going to meet a lot of people, taste different food, amaze with the scenery of our country and many more. Travelling is so much fun, just don't forget to enjoy and be safe. Oh and Ijust followed you Glen, so I could be abreast with your updates. Godspeed! You are on the way to being an inspiration to travelers and back packers in our country..
Im just envious of this, and perhaps with what you do for living. 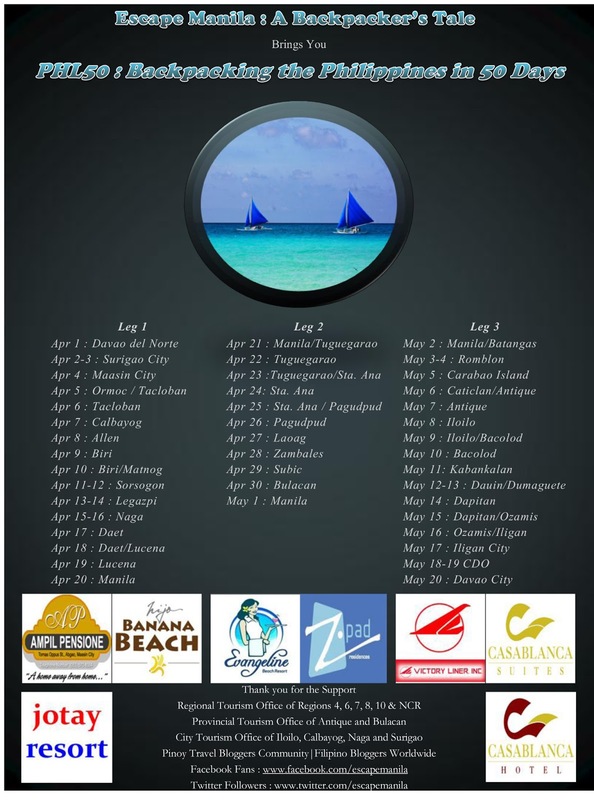 Great Advocacy… Lets continue to promote the Beautiful spots in our country..:) Good Luck! definitely, you really love to travel… please update us with your adventures. Yahweh bless. wow! wow! i'm still thinking how to do what you are doing . so determined , and you are really wonderful someone ! hope to meet you sometime in the future. Good luck and be blessed always ! With vision and determination, I believe you can accomplish this feat. Good luck bro. I wish you great success in this journey of yours. Ingat! All the best to your 50-day trip. If only I'm not married with a kid, I could have pursued the same probably before settling down. Nice itinerary mo Glen, Biri, Pagudpud, Zambales, Dumaguete, Antique.. Sagada na lng kulang hehe, lami-a muuban uie.